Guide to embedding custom code and scripts in your pages. 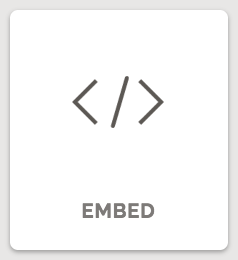 Embed is an element component. This component allows you to embed code snippets into your page, such as a Spotify playlist, Vimeo video, or Facebook status. You may want to use an Embed component for any custom HTML/CSS to see how the code will look as you edit the page. ⚠️ Note: if you are trying to embed script tags, use the header and body script fields located in the Custom Code tab of your Page Settings.